Yesterday the Independent highlighted how rising sea-level rise is causing catastrophe in the South Pacific, and today the New York Times reports of melting Himalayan glaciers, which “points to a looming worldwide concern, with particularly serious repercussions for India and its neighbors”. The paper reports: “The thousands of glaciers studded across 1,500 miles of the Himalayas make up the savings account of South Asia’s water supply, feeding more than a dozen major rivers and sustaining a billion people downstream. Their apparent retreat threatens to bear heavily on everything from the region’s drinking water supply to agricultural production to disease and floods. A recent study by the Indian Space Research Organization, using satellite imaging to gauge the changes to 466 glaciers, has found more than a 20 percent reduction in size from 1962 to 2001, with bigger glaciers breaking into smaller pieces, each one retreating faster than its parent. 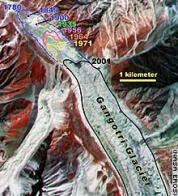 A separate study found the Parbati glacier, one of the largest in the area, to be retreating by 170 feet a year during the 1990s. The Times chronicles the experiments of one scientist, D.P. Dobhal, a glaciologist who has spent the last three years measuring the Chorabari glacier in the Himalaya. According to Dobhal’s measurements, the Chorabari’s snout has retreated 29.5 feet every year for the last three years, conforming to a disquieting pattern of glacial retreat across the Himalayas. Think of the glacier as a bank account, says Dobhal. It total volume is “how much we have in the bank,” and so the glacial meltwater is like a dividend being released for everyday use. But what happens when the bank account is empty?